For those of us who work as engineers in the software industry, we may have patented a few things related to software in our careers. Typically, engineers and designers sign an agreement with their company that irrevocably gives that company full control of the patents. The company then can use them however they want, which may include selling them to others who can also use them however they want. These days, there are many non-practicing entities stifling progress, aiming offensive patent lawsuits at software and high-tech companies who are innovating and moving the industry forward. We can do better than this, today at Twitter I’m proud we announced the Innovators Patent Agreement (IPA). 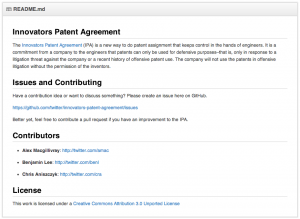 The IPA is a new way to do patent assignment that keeps control in the hands of engineers. It is a commitment from a company to the engineers that patents can only be used for defensive purposes–that is, only in response to a litigation threat against the company or a recent history of offensive patent use. The company will not use the patents in offensive litigation without the permission of the inventors. With the IPA, employees can be assured that their patents will be used only as a shield rather than as a weapon. We are still in early stages, and have just started to reach out to other companies to discuss IPA and whether it might make sense for them too. We have posted the IPA on Github, with the hope that folks improve the IPA in an open source fashion and share it with their respective companies.